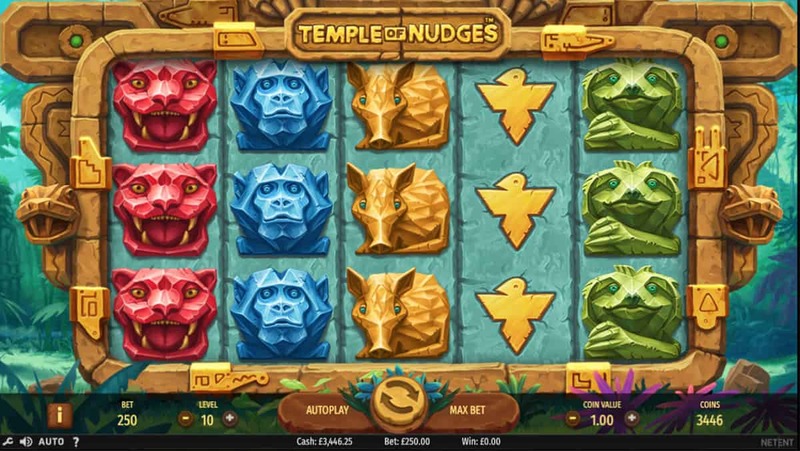 NetEnt has given us ancient ruins with an Aztec theme before on its epic Gonzo’s Quest slot, to name but others. But that title was such a fans’ favourite, how could the Swedish maestroes trump that, or even follow it? By creating something completely unique and original which still gives us our Aztec fix, that’s how. 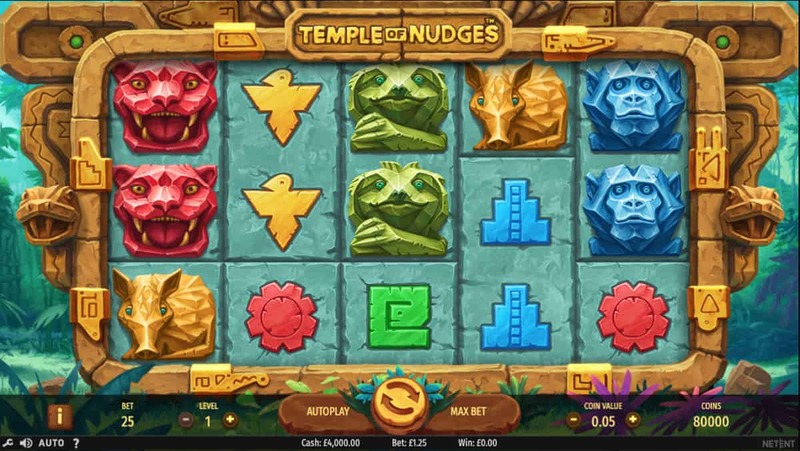 And that’s where the Temple of Nudges slot comes in. But there’s a lot more than meets the eye on this Aztec adventure. As the title might suggest, the temple plays a key part in this slot, making us feel as if we’ve travelled back in time to pay our respects to ancient gods. It’s almost as if we’re gazing at the entrance of a temple, with the reels encased within a golden, stone coloured frame. On either side are two snake statues which contrast to the various coloured symbols. These include Armadillos, Cougars, Monkeys, and Birds, all of which are angular in design and come in various colours. NetEnt went to painstaking effort to give the appearance of animals that had been carved out of stone. Though no doubt it was a lot easier drawing these up on the computer than the processes ancient civilisations went through! The typical payouts from NetEnt return, along with similar layouts for the spin buttons and auto bet and max bet on either side. This familiarity helps any NetEnt fan know what to expect and where to search when looking for game information, and also makes for super easy gameplay. As the reels spin, we get a flash of colour before the symbols fall into place with a thud. Then the thudding continues with the Nudge feature. This is triggered each time we land a winning combination of three or more matching symbols. At the top of the screen, the game title splits in half and reveals how many nudges we have. As symbols move down after a nudge, it can keep going on and on, helping us to land those wins. But that’s not all. All slots studios love a Re-Spin feature, not least Microgaming which used it to such great effect in its Crystal Rift slot, released via that studio’s partnership with RabCat. In Temple of Nudges, the Re-Spin feature can also come into play if the Re-Spin symbol appears on a winning spin. We’re trying to get ‘Nudge Nudge, Re-Spin” to catch on as a phrase after all the action that takes place. Hasn’t happened yet, but we will persist. 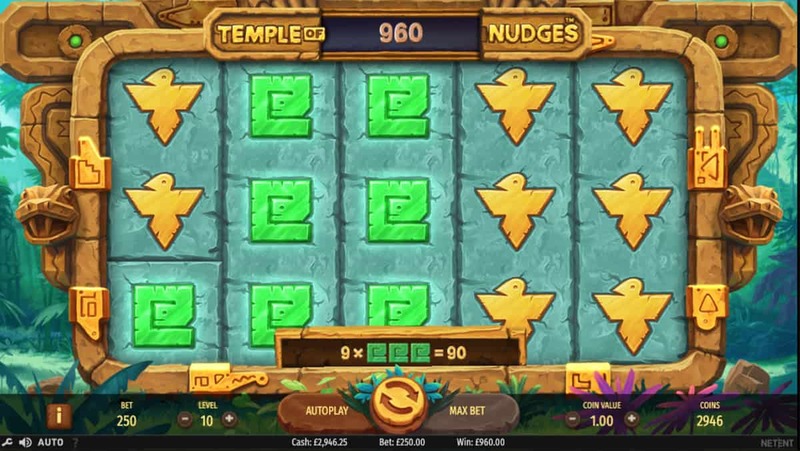 NetEnt gives us another Aztec themed slot, yet it’s very different from its previous slots and this is definitely noticeable thanks to the Nudge feature. This particular feature harks back to fruit machines of yore where we’d hold or nudge symbols to get that elusive third match. However, the mechanics on this are very different as the nudges are automatic. When we get loads of nudges in quick succession, it can be quite jarring watching the reels jut down a line. It fragments the gameplay slightly, especially when there are no Free Spins which offer continuous action. But when we can win up to 2,187 coins on each Re-Spin, we’ll happily wait and watch the symbols nudge away!